﻿Who Are the Georgia Pond Stars? Jeff Krenner of Paradise Ponds & Waterfalls knows The Pond Stars, he has worked hand in hand with them on episodes right here in Buford, GA building a turlte pond. Another filming in Dacula GA featured a pondless waterfall installation into a backyard landscape. Their show is currently filming a new YouTube season. ﻿A backyard is a terrible thing to waste, especially when it has the potential to invigorate the surrounding ecosystem. But, what’s a homeowner to do? They can call the Pond Stars – Aquascapes "A" Team, the world’s best pond builders, who can turn any barren plot into an attractive, inspirational and even, healing oasis. Now, ask your self: "Is my Pond Guy Certified?" The fact is that every Certified Aquascape Contractor is Pond Star (Aquascape) Certified. 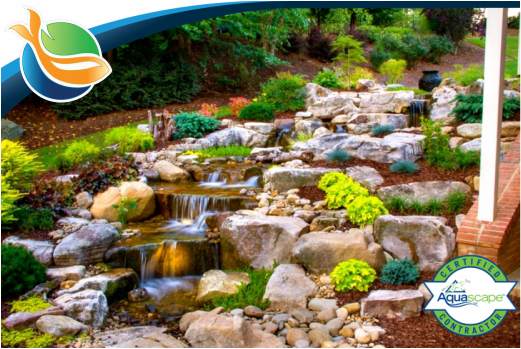 From excavating the Pond to finishing the stream every pond builder certified by Aquascape Inc takes an oath to follow the exact same methodologies as the Pond Stars exhibit on National Television. If you have not had a chance to watch the Pond Stars we encourage you include them in your "Must Watch" list. The Pond Stars series can be found on iTunes.